The main benefit of owning a dash cam is the peace of mind that comes with knowing that no matter what transpires on the road, another pair of eyes is watching over you. Often this comes into play whenever there’s an accident with another party. With so much at stake and two differing accounts as to what actually transpired, a dash cam proves you with irrefutable evidence of the incident in question. This is vital to proving your innocence to law enforcement and your insurance company, who will no doubt want to raise your rates if they deem you were at fault. Most dash cameras have a forward facing camera that watches the road in front of you as you drive, but we now find dash cams that face both the front and rear of the vehicle at the same time, giving you twice as much protection. These are known as dual channel dash cameras. There was a point when dual channel dash cams were a rarity, but as technology has advanced rapidly in recent years, the number of dual channel dash cams has likewise grown exponentially. If you are currently in the market for a dual channel dash camera you will find a vast number of excellent options. The difficulty of course is that almost all of these dash cameras do more all less the same thing. With varying prices and a wide range of features, how to decide which dual channel dash cam is the right one for you? What is a reasonable price to pay? Which features are absolutely necessary and which are mere luxuries? What resolution is best? And which brands to trust? Fortunately for you we’ve made a list here of the best dual channels on the market right now. In doing so we’ve made your job easier so that you can focus on more important things. Take a look at our list of best dual channel dash cams below. We’re confident you’ll be able to find a good option that not only matches your specific needs but falls within your budget. Why not simply buy two one-channel dash cams? The PowerLead dash cam is a great, affordable choice for a dual channel dash camera. The front-facing camera films with a 170-degree wide angle lens and the rear-facing camera captures 120 degrees meaning on both ends you record more of the road as you drive. The PowerLead also supports night vision recording and features a large, clear 2.7” screen that allows you to control and adjust the various settings of both cameras with ease. The PowerLead also comes with multiple vents for cooling so that the camera is less likely to overheat in extreme conditions. 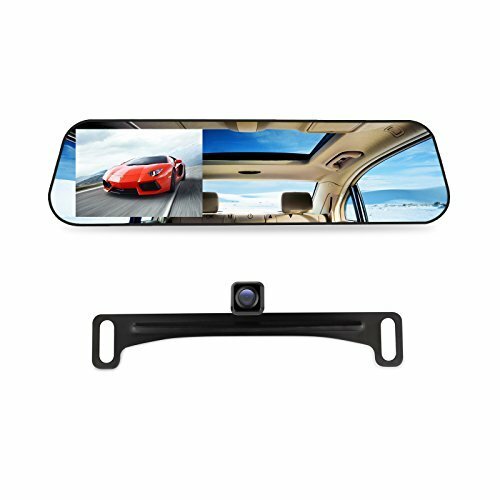 The Carsun V3 offers an alternative design to the numerous rearview mirror cameras on this list. Instead of fitting over the rearview mirror, the Carsun V3 attaches via suction cup which depending on your preference might be a good or bad thing. The four-inch LCD screen shows the footage from cameras simultaneously via picture in a picture display. Both cameras can film in 1080P and both cameras capture a wide berth of the road, 170 degrees both ways. The Carsun V3 looks like an ultrathin point and click camera and is made of aluminum alloy, a strong frame that is good for withstanding extreme temperatures. The WDR technology of the Carsun V3 allows the camera to automatically adjust between light and dark lighting conditions, ensuring you get the best quality picture no matter what time of day you hit the road. The AutoVox M2 is another rearview mirror dash camera. The nice thing about the AutoVox M2 is that it will automatically adjust it’s display depending on what direction you are driving. For instance, when backing up, the AutoVox M2 will display the view from the rear camera. Similarly when driving forward, the camera will show the view of the road directly ahead of you. You can even use the camera as a kind of parking guide, alerting you to hazards and other cars immediately behind you. Installing the AutoVox M2 is easy and straightforward. It fits easily over most rear view mirrors. The rear-facing camera is also waterproof in the event that you want to position it somewhere outside the vehicle. 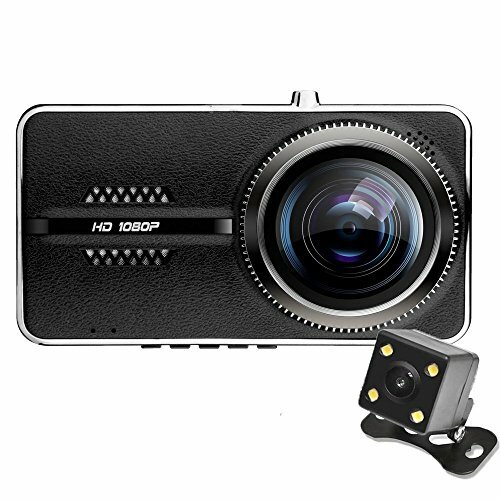 The ITrue X6D dash camera, unlike other dash cams on this list, is actually comprised of two separate cameras connected by a cord as opposed to a single device with two cams built into the same piece of equipment. It’s also significantly more expensive. The unique triangular stealth design makes it easier to position with your vehicle and also easier to hide from prying eyes. Installation is easy as the camera affixes to the position of your choosing with a single piece of 3M tape. Small but powerful, the ITrue X6D films in full HD at 1080p and boasts superior night vision capability. Also comes with a hardwire kit and G-sensor technology which locks any files recorded when the camera detects an unusual vibration within the vehicle from an accident or a severe lane change. The Merrill, like the ITrue, is comprised of two separate cameras, giving you the freedom to position each camera wherever you like within the vehicle. The front camera films in 1080p and the rear camera films in 720p, but this is more than powerful enough to record important details like license plates. The Merrill also boasts superior night vision technology and features a super-wide fish angle lens on the front camera. 170 degrees means you capture everything on the road and then some. With a full 3-lane coverage, there are virtually no blind spots with the Merrill. 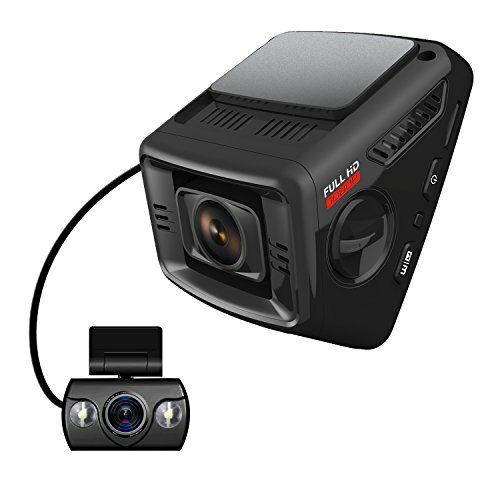 The KDLINKS R100 is one of the more expensive dual channel dash cameras on this list, and for good reason. The front camera films in the highest quality we’ve come across so far – a whopping 1296P, which equates to something like super super HD. The back camera films in 1080P, full HD, and both cameras capture a full 140 degrees of the road in front and behind. THE KDLINKS R100 can even support SD cards up to 128 GB! 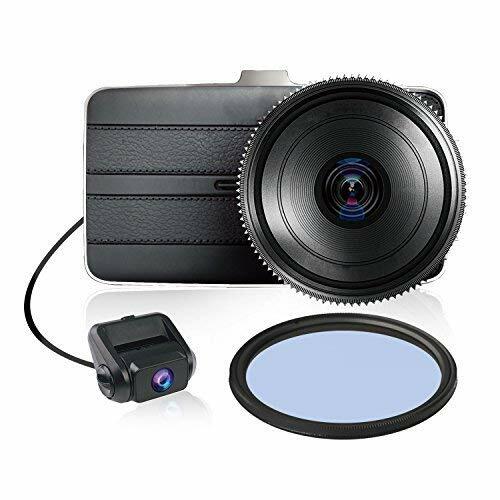 The antiglare mirror and super slim design and the large 5-inch screen of the KDLINKS R100 are additional features that make this camera well worth your time. Another excellent feature is the auto-off feature that shuts down the camera after no movement is detected after 5 minutes. This not only saves you battery life but also prevents you from having to turn the camera off and on all the time. Also comes with a superior parking mode that, when connected to a constant power source, will start recording when any movement is detected around the vehicle. 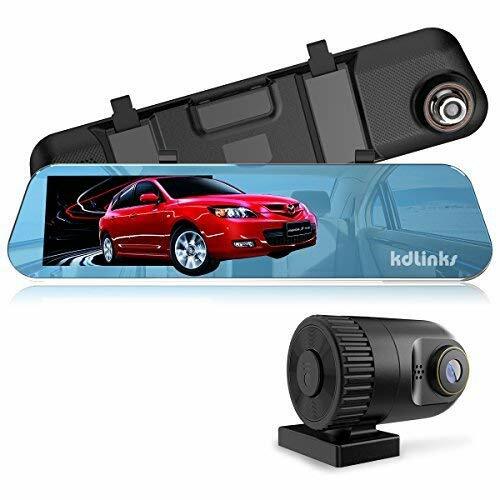 The KDLINKS DX2 is just as pricey as the KDLINKS R100 listed above, but instead of attaching to your rearview mirror, it attaches via suction cup at the location of your choosing. While it films in slightly worse quality than the KDLINKS R100 (front camera: 1080p, back camera: 720P) it might be a better option for a driver who finds the rear view mirror option somewhat distracting. Combined, both lenses cover 290 degrees of the road: 165 degree form the front view, 125 degrees of the back view: a total spread of the road. Also comes with G-sensor technology and a superior battery that can withstand severe temperatures whether they be hot or cold. The KDLINKS DX2 might be a good choice for people who live in extreme climates. The Z-Edge camera is another dual channel dash cam that fits over the rearview mirror of your vehicle. The front camera films in full HD, but the rear facing camera only films in 480p. This is certainly not high definition, but for the purposes of identifying tailgaters it works perfectly, able to capture the license plate without a problem. While it only films 120 degrees of the road in front of you, the Z-Edge camera still gives you a fisheye view so that you capture any activity on either side of the road. It also comes with a parking mode feature that allows you to keep an eye on your vehicle even when you’ve stepped away temporarily. The Evoplus also features a rearview mirror design with a full 5-inch LCD screen so you can make adjustments to the camera and edit videos without having to upload to some external source first. Motion detection software keeps a steady eye over your car when it’s parked, recording for 5 seconds when it detects movement and then powering off automatically when no further movement is detected. The Evoplus also comes with lane departure technology and a collision warning system to keep you and your loved ones safe. The front facing camera films in 1080P and the rear in 720P and captures 140 degrees of the road in front. The PowerLead PDVR is the last dual channel dash camera to be featured. Made by the same company that manufactures the first camera on our list, the PDVR by PowerLead offers a modern, alternative design and can be attached via a suction cup that allows the user to tweak its position within the vehicle. Unlike its cousin, the PowerLead mentioned first on our list, the PDVR is really two separate cameras, attached together, as opposed to a single device which hosts two cameras in the same body. The PDVR supports night vision technology and promises a crystal clear shot of cars 30 feet away, easily detecting license plate numbers and other important details in the event of an accident or some unforeseen incident on the road. The high quality battery can easily withstand extreme temperatures making it a great choice if you live in unusually warm or cold climates. The Crenova dual dash camera is very similar to the Ample Power listed above. It too, fits over your rear view mirror. The LCD screen is slightly larger at 5 inches, but the functionality is more or less the same. 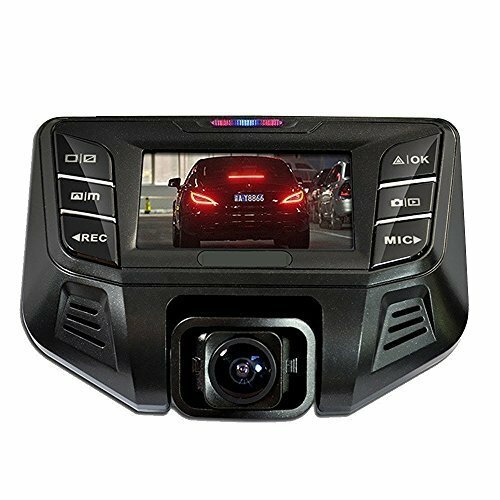 Both cameras record in 1080p, in full HD, more than enough to ensure you capture important details like license plates and facial features of other drivers and important road signs. The Crenova also supports night mode recording so no matter what time of day you are out on the road, the Crenova has you covered. Consider that when using both cameras to film at the same time you get a full 240 degrees of coverage around your vehicle. The Cobra is a more expensive option featuring a split screen display that allows the user to view footage from both cameras simultaneously. 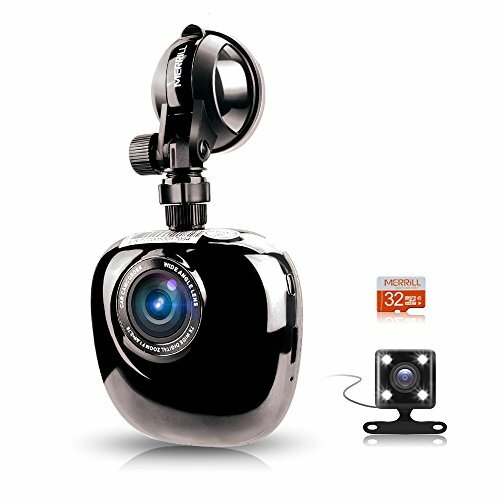 Capable of filming 160 degrees of the road in front and 130 degrees of the road behind, the front camera films in full HD 1080p while the rear records in slightly lesser quality, 720 p.
Ready to use out of the box, the Cobra is easy to install via a suction cup that mounts directly onto your windshield or dashboard. The G-sensor technology will lock any files recorded during an accident or whenever the dash cam detects some unusual vibration inside the vehicle. The Ample Power dual channel dash cam is another excellent choice that won’t break your budget. For the price, it’s one of the best options available. Unlike most dash cams that are a separate entity within the vehicle, the Ample Power affixes to your rearview mirror, turning your mirror into a camera that shows both the front and back of the road at the same time. Like the PowerLead, the Ample Power films the front view in 170-degree wide angle and the rear view in 120 degrees, giving you more footage of the road each time you drive. The massive 4.3-inch screen (almost twice the size of the PowerLead listed above) allows you to adjust camera settings with ease. The benefit of owning a dual channel dash cam is obvious: accidents are just as likely to occur at the rear of a vehicle as at the front, and with a pair of eyes on both the front and back of your car you get twice as much protection. With a front facing dash camera, only the front of your car is protected. But think of all the problematic incidents that can occur from the rear. Think of reversing down driveways into the street, or backing out of busy parking lots. Consider that the possibility of someone clipping you from behind is just as likely (if not more) as you hitting someone head on. What if you are forced to stop suddenly because of something in the road and someone hits you from behind? You will need to be able to prove that the person that hit you was tailing you too closely and that the incident in question was not unavoidable or on the other hand, was the other person’s fault entirely. Accidents aside, there are other benefits to owning a dual channel dash camera. If hardwired to your vehicle the dual channel dash camera an acts as a kind of all seeing security camera for your car, making it easier for you to identify someone who may have done damage to your car. Some cameras feature motion detection technology which will automatically start recording whenever the camera sense some kind of movement within the camera’s line of sight. You can even use the rear facing dah camera to record activity within your vehicle as you drive. Cab drivers and Uber drivers have been known to record the interior of their vehicles in order to ensure their own safety. Parents have been known to record the activity inside their teenager’s car to ensure that rules are being followed and people are not distracting the driver with loud music. Truckers use rear facing dash cams to keep an eye on their prized cargo. Furthermore, think of the aesthetic possibilities of having a front and back facing camera. With a dual channel camera you can record the conversation and activity inside your vehicle as you go on a long drive so along with the beautiful scenery recorded through the font windshield you get recordings of family sing-alongs, arguments between siblings, or the running commentary of passengers as you drive. The possibilities are endless but in every instance, owning a dual dash cam is prudent. There’s no doubt that two cameras are better than one. You might be thinking it would be a better idea to buy two separate dash cams and position one at the front of the vehicle and one at the rear. In theory this sounds like a good idea but it makes much more sense, not only financially but logistically, to buy a dash cam that already has two lenses that record simultaneously. Here’s why: first – you’ll find that it will be much cheaper to buy a dual channel dash cam than to buy two separate dash cams and two separate hardwiring kits. Furthermore, with a dual channel system, the cameras typically already come with advanced features like GPS technology and WIFI. The other drawback to two separate cameras is that you will need two separate SD cards, which means more money and more confusion. Instead of worrying about which card belongs to which camera, stay organized and keep life simple. Additionally, the dual channel dash camera will end up being more inconspicuous within your vehicle than two separate cameras. A single camera would not only be less of an eyesore within your vehicle (fewer wires, less clutter around the fuse box) but it would be less noticeable to potential thieves looking to steal a camera from your car. Two dash cameras might actually convince thieves that there is something worth breaking into your vehicle to steal. For these reasons and for your bank account, it’s best to simply go with a single dual channel dash camera. When it comes to protecting your vehicle, it makes most sense to buy a dual channel dash camera, which can keep two pairs of eyes on both the front and back of your vehicle. Comprehensive coverage gives you the true peace of mind you are looking for. While typically the rear-facing dash camera records in a lower resolution than the front-facing cam, the resolution should be more than adequate for the purpose of keeping a look out and providing evidence to law enforcement or insurance companies. From extreme tailgaters to fender benders to reckless drivers and hit and runs, the more eyes on your vehicle the better. In the world of driving, it’s always better to be safe than sorry and with dual channel dash cams becoming more popular the price of these items is falling in kind, making them more and more affordable each year. Of course, each of the options on our best list of dual channel cameras comes with its own benefits and drawbacks. But with this comprehensive list before you, we’re sure you’ll be able to locate the dual channel dash cam that best fits your needs and your budget!